Website and processes: 20 Apr 16 Debbie , 5/5 Excellent "Quick and easy to use. 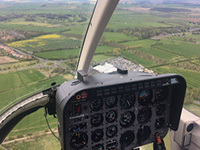 Fast reply via email and payment was easy"
A 50 minute helicopter flying lesson with Hover Challenge! Includes: ca.30 minute briefing, 20 minute hands on flight and insurance. Voucher can be used at locations nationwide.